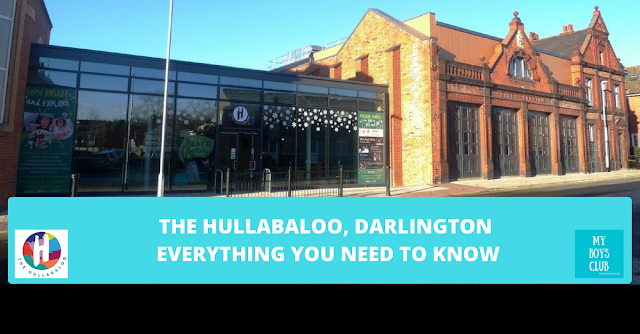 The Hullabaloo is a new venue specially designed for children, young people and their families in the North East. Based in Darlington as a national centre of theatre for young audiences it is an inspiring place to play and learn. It will present world-class performances for children, house mind-blowing creative play installations, offer a wide range of creative opportunities and classes for families and be a focal point for creative education. Providing a great place to spend some quality family time in the heart of the town. It is located on Borough Road in Darlington and adjoins the recently renovated Darlington Hippodrome Theatre. It has been created in a former Edwardian Fire Station and adjacent land and transformed into a purpose-built venue. What Makes The Hullabaloo Different? According to Albert Einstein, 'Play is the highest form of research' and it is at the centre of the whole building. It is a wonderful space where children can play, learn, be creative and watch performances especially for them. The Hullabaloo has been designed with children at the forefront of all the design, architecture, facilities and services. 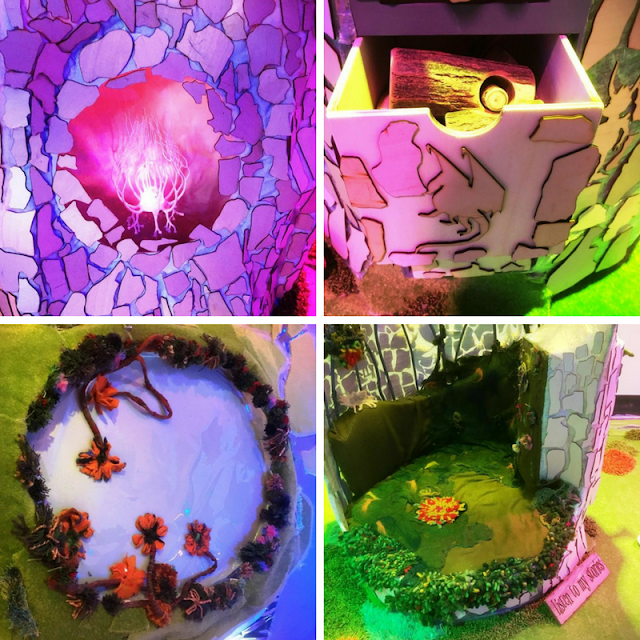 Truly child-centred, children were consulted on all aspects of the building, performances and installation - and have collaborated with Theatre Hullabaloo to create this amazing place. From the seats, the toilets, the signage, box office, cafe and play areas the whole building has been designed so children can let their imaginations run free in a space specially created for them. What else will I find at The Hullabaloo? At The Hullabaloo you'll find creative play installation space, an outdoor play space, a theatre and a family café area - Café Hullabaloo. What is Bear & Butterfly? Bear & Butterfly is the opening show at The Hullabaloo. Commissioned by Theatre Hullabaloo, it is a charming tale of changing friendship for everyone aged 4 and above. Opening on Tuesday 12 December the show will have a run of 21 performances until the end of the year, including Christmas Eve and Boxing Day before heading out on a national tour. A perfect first theatre experience, Bear and Butterfly is a 50-minute show suitable for the whole family. When a grumpy Bear finds a cheery Caterpillar munching on the leaves of his tree one day, his first thought is to ask him to leave. Gradually, however, they become best friends as Caterpillar munches through heroic tales of Bear’s younger life. One day Caterpillar becomes sick. Bear fears he will lose his friend, but instead, he grows into a beautiful butterfly who flies high and has stories of his own. Puppetry, live music and beautiful storytelling combine in this charming tale about love, loss and friendship. Bear and Butterfly will run from 12 - 31 December. Tickets are from £7 and available by calling the Box Office on 01325 405405 or online. Are there free things to do at The Hullabaloo? Yes, the creative play, café space and outdoor play are free areas to use. The creative play space is at the heart of the venue. This is an intimate space that incorporates a range of performance, storytelling, exploration and play. The Gillian Dickinson Creative Play Space will house FREE immersive mind-blowing creative play installations and a range of participatory activities. The first installation is Enchanted Forest - it is full of interactive flowers and trees and is an amazing feast for your senses. As an adult I loved it, so relaxing. The lucky first children to play in the space loved it too. Their school had been part of the consultation process and helped create the new space. How amazing must it be for a child to see your drawings come to life ... and be able to play in it! It really is like stepping into the pages of a children's book. You can create a tune on lily pads, hear your words echoed out after being funnelled through a tree, feed a frog to change colours, draw with light, relax in a story tree and listen to stories literally at the touch of a material button. It will be at The Hullabaloo until the end of January 2018. The café is positioned at the front of the building and is the main entrance into the venue. 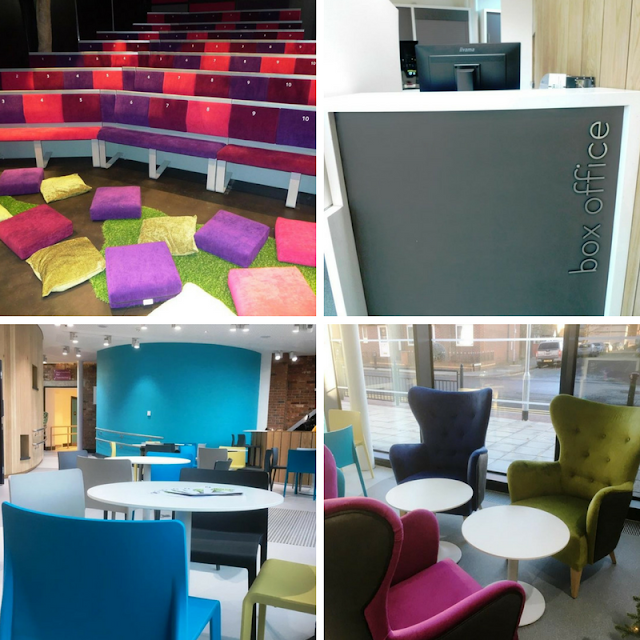 The space is an informal, brightly coloured, comfy family friendly environment with pop up activity. It features interactive colour changing lights, projection, play area, storybooks and lots of healthy food and drinks to enjoy. It is open Monday – Saturday from 10am – 2pm. Outside of these times, the venue will open 30 minutes before a performance begins, and is only open on Sundays when a performance is on. The Hullabaloo is the brainchild of Theatre Hullabaloo, a pioneering organisation that makes, tours & promotes theatre for young audiences, aged 0 – 16 years old, because it believes that they are the most important audience of all. They create pioneering work which puts the young person at the heart of the creative process. They believe that access to high-quality theatre is a cultural entitlement of all children. Who else has helped create The Hullabaloo? 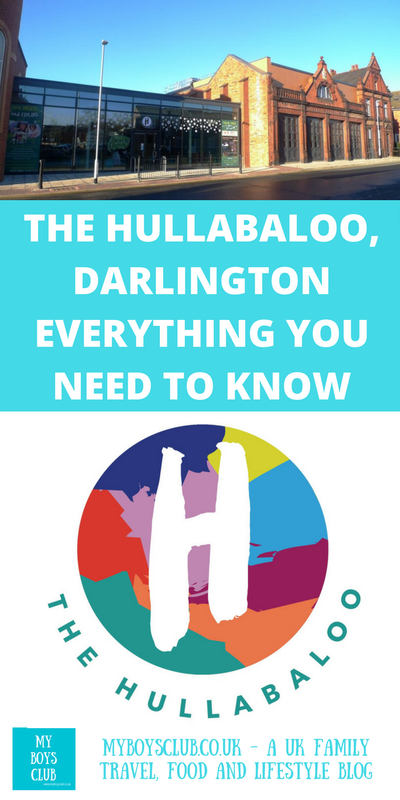 The Hullabaloo is a partnership between Theatre Hullabaloo and Darlington Borough Council. 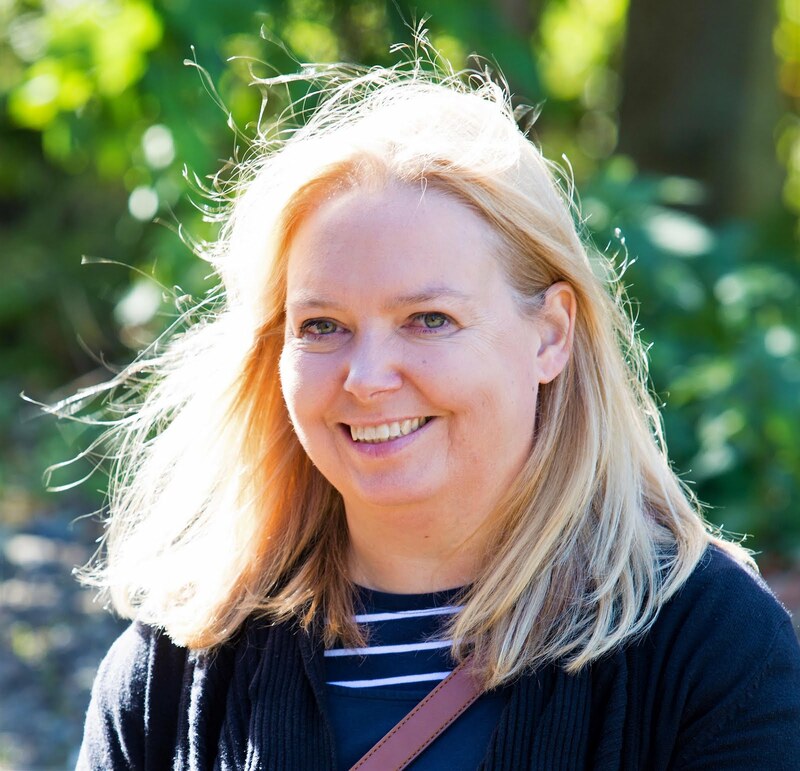 The total cost for the capital development is £2.8m and is funded mainly through grants from Arts Council England (£1.5m)and Darlington Borough Council (£800,000), alongside funding from trusts & foundations. Have you been to The Hullabaloo yet?